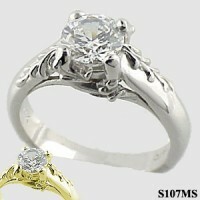 Antique style Solitaire Ring with Floral/leaf designs. Available in white or yellow gold... Very heavy ring, shank & prongs!!! This is a stock item up to a 2 ct stone, other stone sizes by special order. Set and finished to order in 2-5 days.